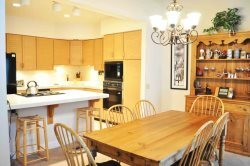 This San Sierra Mammoth Lakes one bedroom, one bathroom condo has recently been remodeled sleeping up to 4 guests with a pull-out sofa and futon located in the living room. The master bedroom has a king size bed with plenty of space and storage for your stay. The condo has a full bathroom with an extra vanity area just outside the master bedroom. The convenience of San Sierra allows guests to easily walk a couple of blocks to The Village at Mammoth’s shopping district, as well as the shuttle stops off of both Canyon Blvd. and Lakeview Blvd. You’re sure to enjoy the wood burning stove while relaxing on the huge family sofa, and utilizing the new flat screen TV with DVD player. This home also has a private deck just outside the living room that is stocked with fire wood for your use. The San Sierra Mammoth Lakes condominium complex has a hot tub and sauna on-site for your use after one of those long Mammoth days, as well as on-site laundry facilities.